Stephan Bonnar tested positive for a steroid called Drostanolone.Â He admits using them to recover and thought they would be out of his system before he was tested for the fight.Â But they weren’t.Â So, he got busted . . . and punished. Hew wants his fans to be sympathetic, because he didn’t mean to cheat.Â Somehow, I don’t feel sorry for him! 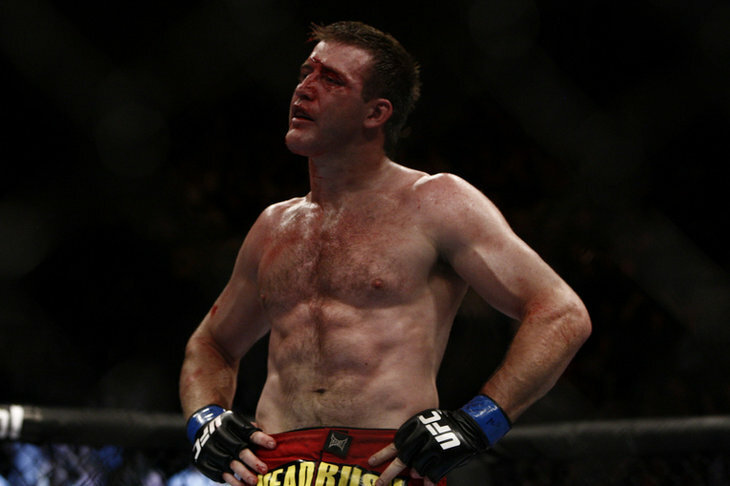 Stephan Bonnar never meant to cheat. That’s what he says now, five months after being busted for steroids, testing positive for Drostanolone after facing Anderson Silva. Even so, he acknowledges that he did take the banned performance-enhancing drug prior to accepting the Silva fight. Those two statements may sound like they contradict each other, but according to Bonnar, the purposes for his usage had nothing to do with his pro fighting career, which was then dormant, and everything to do with trying to fix his ailing knees. In his first public interview since the October 2012 match, Bonnar said on Monday’s edition of The MMA Hour that after being shelved for months and being advised to retire by UFC president Dana White, he had given up hope of closing out his career with a major fight. In that time, he’d undergone a pair of stem cell procedures on his injured knee. Two months after the second stem cell procedure, he decided he wanted to return to the gym to get in shape and help some of his friends train. In doing so, he made the decision to obtain some chemical assistance. But then, out of the blue, the semi-retired fighter got the phone call he never thought was coming. After about 10 months without a fight, he was being asked to compete against the the sport’s pound-for-pound king, Anderson Silva. Faced with the opportunity, he looked at the calendar, and then the scale. He had three weeks to train, and 35 pounds to lose. And, he says, if you think he would intentionally take steroids when he had that much weight to lose to make the light-heavyweight division’s 205-pound limit, you are crazy. Bonnar said that because he’d stopped taking the drug a few weeks before the call to fight Silva, he had been told by “every expert I talked to” that it would be out of his system by the time he faced Silva on Oct. 13. Since then, his life has been difficult, at least on the professional side. While he and his wife Andrea recently welcomed their first child into the world, Bonnar said his happy announcement was met with many rude and angry messages from those who took the opportunity to scold him for what he’d done. It’s also changed his relationship with UFC bosses Dana White and Lorenzo Fertitta, who have previously said Bonnar would be in the UFC family for life. Since the positive test was announced, Bonnar hasn’t had a single conversation with them. Since then, Bonnar has mostly been laying low. He says his business interests have struggled because “people don’t want to do business with me. I’m a bad name.” He’s done some charity appearances, namely for the organization Garrett’s Fight, which provides special-needs athletes opportunities in the martial arts, but even that, he says, was overshadowed by his drug-test failure. So that’s why he’s been so quiet. As far as what’s next for him, he doesn’t know. He continues to spend time with his family, and this Friday, he’ll make a rare personal appearance at Harrah’s in Lake Tahoe. And despite his two surgical procedures, he’s going to need another operation on his knee in the coming weeks. At 35 years old, he doesn’t think he’ll ever fight again. In other words, much of his life is currently out of his control. For an athlete whose named was tied closely to the UFC brand — an athlete who often represented the brand during public relations opportunities, personal appearances, community outreach and more — the unraveling of it all has been been painful to deal with. He knows at some point, things may change, but right now, the strained relationship is just another piece of his career that he may never fully mend.